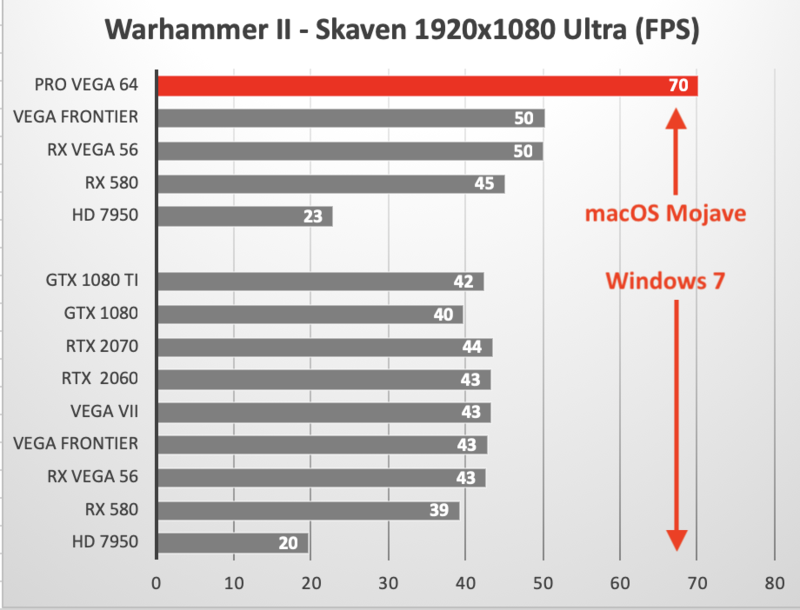 Total War: WARHAMMER II - How Fast Does It Run On The Mac? Feral Interactive released Total War: WARHAMMER II in November 2018. We decided to benchmark it on two of our Macs using macOS Mojave and Windows 7. HD 7950 = AMD Radeon HD 7950 "Mac Edition"
All GPUs (except the Pro Vega 64) were installed in a 2010 Mac Pro 12-Core 3.33GHz Xeon X5680 running either macOS Mojave or Windows 7 Ultimate 64bit. The Pro Vega 64 was the built-in GPU in the 2017 iMac Pro 8-Core 3.2GHz Xeon W2140-B running macOS Mojave. 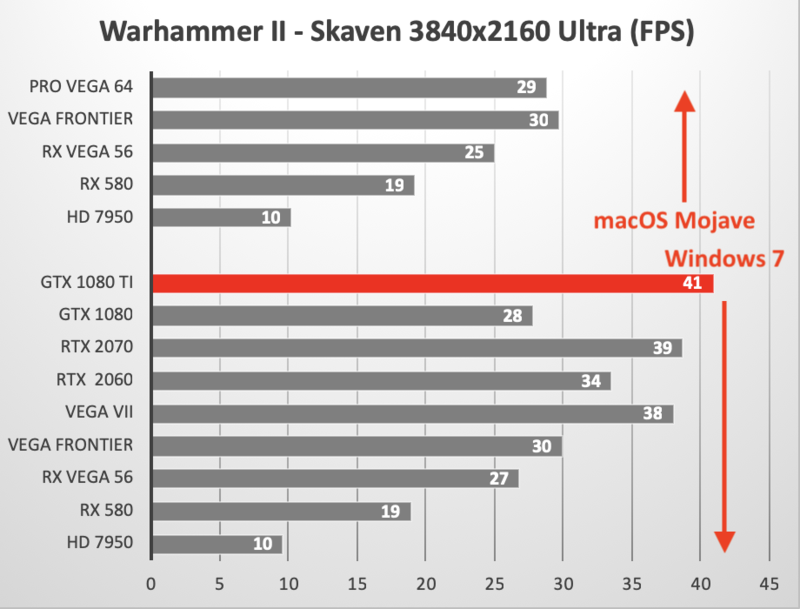 Of the macOS setups we tested, the iMac Pro with the Pro Vega 64 GPU ran Warhammer II the fastest at 1920x1080 and 2560x1440. The Mac Pro tower with the Vega Frontier GPU edged it out at 3840x2160. Be aware that as good as the Vega Frontier performed, it requires more power than the Mac Pro tower's dual 6pin PCIe cables can provide. We supplemented its power needs by feeding the second 8pin connector with an external ATX power supply. Since macOS Mojave does NOT support NVIDIA GPUs and since WARHAMMER II will NOT run under macOS High Sierra, we booted up Windows 7 Ultimate 64bit when testing the NVIDIA GPUs. Plus it enabled us to include the recently released GeForce RTX 2060 and 2070. FLASH: MacVidCards has certain models of NVIDIA GPUs running under macOS Mojave. Under Windows, the RX 2060, RX 2070, GTX 1080 Ti and the Vega Frontier were neck and neck at 1920x1080 and 2560x1440. However, the GTX 1080 Ti posted th best average FPS at 3840x2160 with the RTX 2070 and Vega VII coming in second and third. 1) Feral Interactive officially only supports Mac Pros built from 2013 to present, but we stubbornly persist in testing with our obsolete 2010 Mac Pro using the latest, fastest GPUs. 2) We did not include results for any eGPUs connected to the iMac Pro because the fast Vega Frontier in an eGPU box was slower than the internal Radeon Pro Vega 64 GPU. 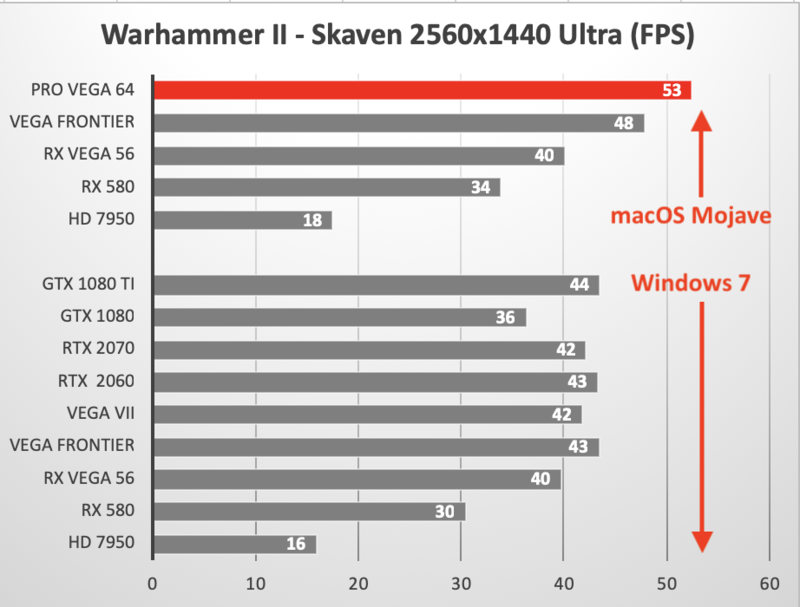 We did, however, get impressive Warhammer II frame rates when we connected the Vega Frontier to a 13-inch MacBook Pro via eGPU. More on that later. 3) The 2013 Mac Pro with FirePro D700 GPUs was not included because it performed no faster than the 2010 Mac Pro with the HD 7950 GPU. B&H Photo Video has the AMD Radeon RX 580 for sale. The RX Vega 64 is back ordered currently. Some good prices for Vega Frontiers on eBAY. B&H aso has NVIDIA GPUs if you are running Windows or macOS High Sierra (with correct NVIDIA driver). MacVidCards has certain models of NVIDIA GPUs running under macOS Mojave.